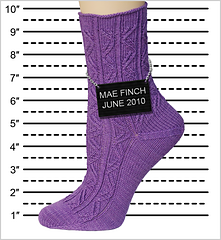 Crafty Detour presents the first pattern in the Criminal Sock Investigations E-Book. 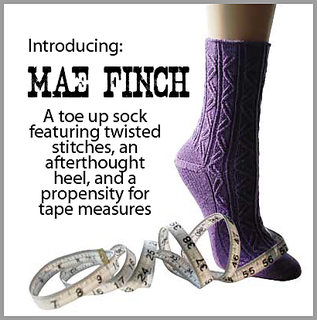 Mae Finch: A toe up sock featuring twisted stitches, an afterthought heel, and a propensity for tape measures. These socks are worked from the toe up on two circular needles. 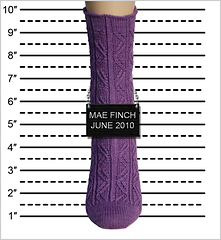 If you prefer, the socks may be worked using the Magic Loop technique, or on double-point needles. Please note that while the pattern as worked looks very small, it stretches quite a bit. The total stitch count is 70 for the foot and 72 for the leg.